I have studied under some amazing Solfège teachers and seen how wonderfully it can help students to audiate and connect with the music, so I try to incorporate it wherever possible, particularly in my early years classes. 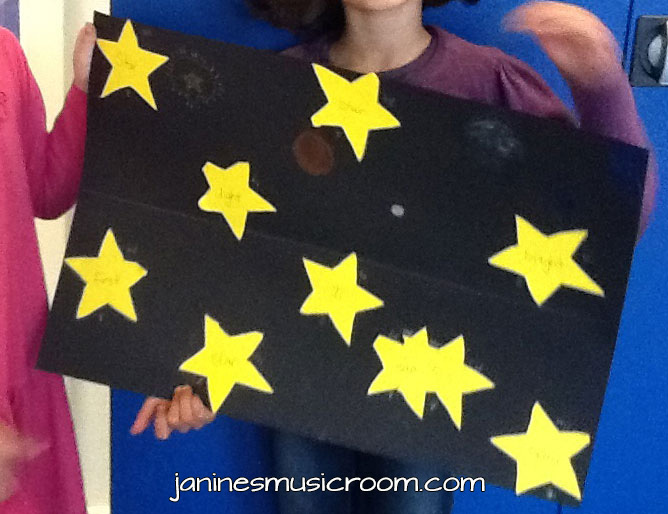 Today I am sharing a project I do in Grade 1, where students try to show the pitch and rhythm relationships of “Starlight, Star Bright” using stars that represent each note. Each star has a syllable of the song. Walking around the classroom, I can hear the students using their Solfège, see the placement of their hand signs, and watch how they translate the audio into the visual. Even before the final product is ready, I have had wonderful opportunities to assess knowledge and understanding. When they finish—and after the important work of decorating their starry skies with planets and spaceships—they record a short video explaining what they did. How much do you incorporate Solfège into your everyday curriculum, both in the early years and later? I do solfege on and off in grade 1 and a little in 2, but I mostly use it for reading exercises. I’m going to steal this idea to help my children with La. They always get confused as soon as we have more the just So and Mi! !